Taste of Italy: What to do with pumpkin? What to do with pumpkin? In Italy, there are many types of indigenous pumpkins- some are round such as Mantovana di Chioggia while others are long such as the Violina from Ferrara. I like to use the Violina (a variety of Butternut squash) with rugged skin. How many types of Butternut squashes are they you might ask? I recently counted 10 varieties of just the Butternut Squash in just one farm's website! The pumpkin is a very versatile vegetable - actually it is a fruit! Italians use pumpkin in many dishes including soups, pureéd, roasted, breads, cakes, puddings, and flans. I have 4 different recipes for pumpkin soup (with even more variations!). Naturally, pumpkin is also found in pasta sauces, in gnocchi as well as in stuffed pastas! In Ferrara, a town northeast of Bologna that is less than an hour away, they call this stuffed pasta Caplaz in dialect or Cappellacci in Italian - which loosely translates to big, old hats. The pasta is folded like a tortelloni however it is several centimeters larger - 6cm. It is traditionally cooked and served smothered in a butter and sage sauce or a tasty Bolognese ragù. The contrast between the sweet pumpkin and the savory ragù makes this a really special dish. Recently, another way to serve these Caplaz has popped up: toss the Caplaz with unsalted butter and drizzle some 12 year-old Traditional Balsamic Vinegar from Modena. The slight sharpness of this type of Vinegar (which has been aged for 12 years in different wooden barrels) contrasts wonderfully with the sweet pumpkin filling. Hungry anyone? 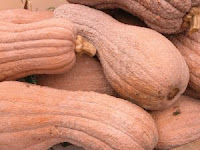 Top photo: Rugged Butternut squashes. Middle: A nearly finished plate of Caplaz. Bottom: A beautiful plate of fluffy Caplaz in a balsamic vinegar and butter sauce.